The annual event attracted several dignitaries including the Vice President of the Republic H.E Paa Kwesi Amissah Arthur, Her Ladyship the Chief Justice, Mrs. Justice Theodora Wood, the Clerk to Parliament, Mr. Emmanuel Anyimadu, the Majority leader Hon. Alban Bagbin, Minority leader Hon. Osei Kyei Mensah- Bonsu, Members of Parliament and the General Secretary of Christian Council of Ghana, Rev. Dr. Kwabena Opuni – Frimpong. 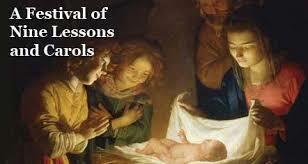 The Festival of Nine Lessons and Carols is a Christian Worship celebration to remember the birth of Jesus Christ and herald the celebration of the Christmas festivities. The Voices of Democracy, Akatsi Central Choir, Tema Diocesan Choir, El Dunamis Minstrels and the Kwashieman Presbyterian District Choir ministered unto the congregation. The General Superintendent, Assemblies of God Church Ghana, Rev. Dr. Frimpong Manso in his exhortation, charged Ghanaians to live a Godly live worthy of emulation. He encouraged the newly elected Members of Parliament to be meek and learn from the experienced Members of the House. He also commended the President of the Republic of Ghana and his vice for serving the nation diligently. The occasion coincided with thanksgiving service by Parliament, in appreciation of God's grace and guidance throughout the 6th Parliament.